The swingset, for example, you never even consider that the chains on a swing are going to fail. Or that little cardboard handle on a case of soda; not going to break. It just won’t. Right? Your kitchen cabinets…they just stay up, on your wall, holding your dishes. Well, not always. The cabinets in our kitchen HAD been there since we moved in, in 2007. They looked like the prefab, off-the-shelf, variety but I always liked them just fine. That was until one evening during dinner we heard a mysterious sound, what turned out to be the sound of the little staples holding the cabinet sides to the back, beginning to pull loose. After they made their first slip the weight shifted to the front of the cabinet, the doors swung open and then CRASH. Six inches of broken glass and ceramic mixed with shards of particle board left in its wake. Lucky for us, after a few months of negotiating, we got our lovely homeowners insurance to foot the bill for a whole new lot of cabinets. We had them custom made and out of real wood! Poplar to be exact – painted white. 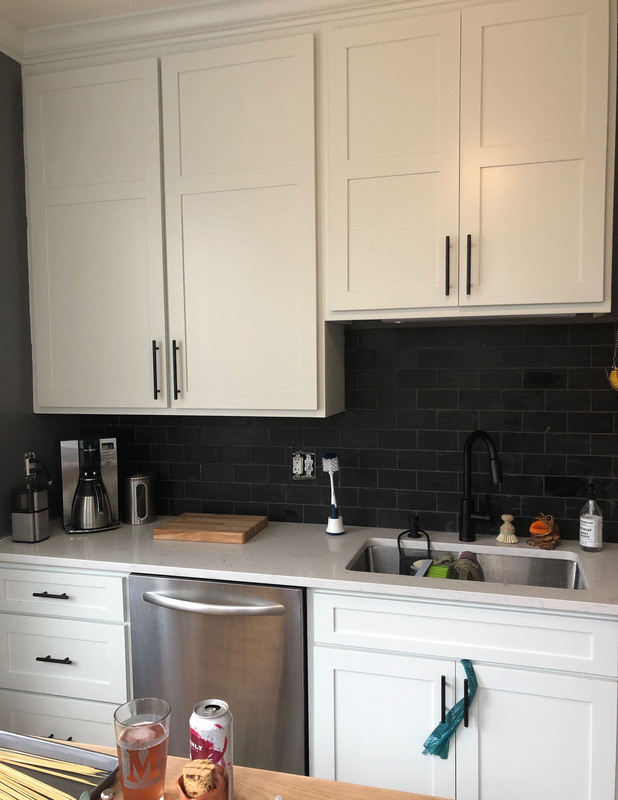 The flimsy particle board that failed us was not built to last – it wasn’t the cabinet’s installation that failed, but rather the actual cabinet construction itself gave up on us. Anyhow, not to say I took advantage of the situation, bbuuuuttt I took advantage of the situation :). With new cabinets, how can we live with the same old countertops and with new countertops, we’ll most certainly need new…APPLIANCES right?! Now, this home, while it has lasted us a LONG time, we STILL think someday we’ll be in a single family home and keep this around to rent, so it’s important we don’t sink more dollars into it than we think will aid in luring reliable renters…so with that in mind, we took to the google machine to understand buying appliances. This is no simple purchase, so let me break it down for you. Like everything there are various ways to go, if you go more premium you head to one of the big box retailers or appliance distributors around town and have a wonderful salesperson guide you through the process. Singing the praises of various brand names and schooling you in the latest features and flares modern appliances have to offer. 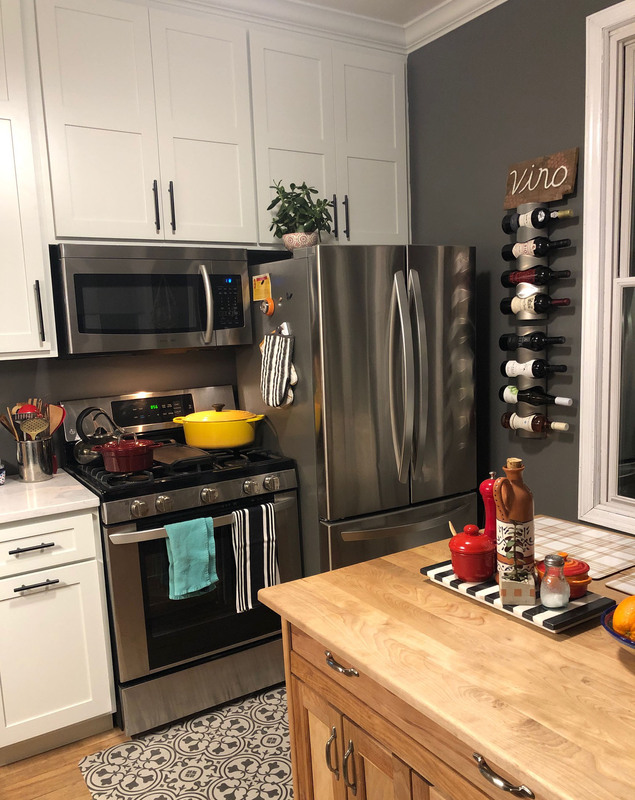 This, however, is easily going to set you back $5k…EASILY…the refrigerator being the big whammy – brand new ones range from $1,000 to $3,000 (and that’s not touching the high-high end stuff). This was not a route we were going to take. Next you could go to the other end of the spectrum and try finding something on Craigslist or Facebook marketplace! Here, you’ll most certainly find the best deal but it also requires you to know what the heck you’re looking for! Will Bob and Sue’s random fridge fit? Work? Can you pull the trigger with just that one option or are you going to have to drive all over heck and gone to find the right one? This also seemed too daunting for us. Third option is to find some sort of discount retailer. There are a few that offer scratch and dent appliances around, but often still at premium price tags. Until we found this place called A-1 Appliance Recycling…it’s kind of a brilliant concept. They pick up old appliances from all over town as well as receive factory rejects…keep them in a huge warehouse in St Paul where they’ve got appliance techs who work all day fixing ‘em up. 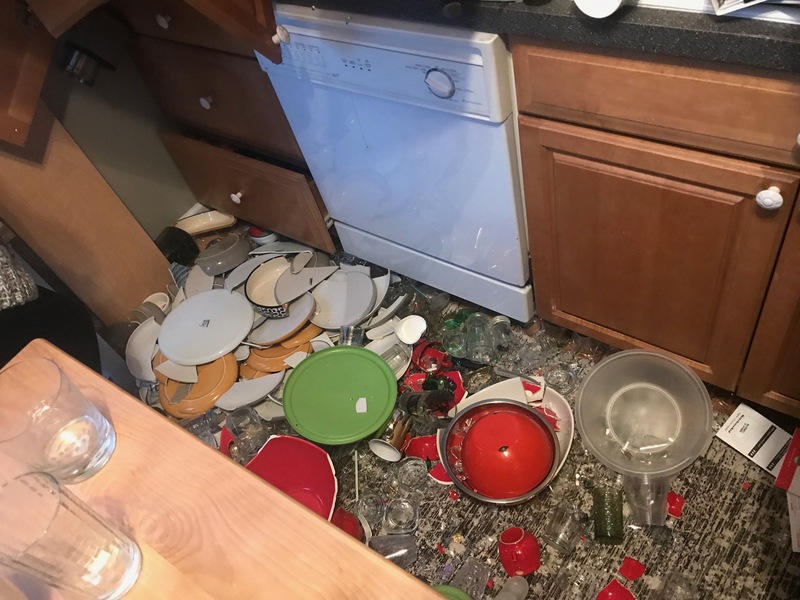 From brand new $3k gas ranges with smashed glass fronts to “DO NOT OPEN THAT DOOR” fancy fridges that came out of a foreclosure, this place has LOTS of options. They have 3 locations around and was the perfect fit for Keven and I. It does require a few trips and honing in on your specifications and budget in order to find what you want. Also, you’ve got to be ready to pull the trigger when you do! But we ended up with a range, fridge and microwave for just about $2k, all brand new. There is a big gouge in the side of the stove but it’s hidden by the cabinet. The fridge is missing a foot that was quickly repaired with a block of wood wedged under there. The microwave…well it does seem to be a little off, randomly requiring an extra-deliberate press of the button to get it to start…but at $150 (normally $450)…it seems worth the risk, and it does heat food. The dishwasher we scored at Bauer Brothers salvage, which was a complete luck of the draw, we were there just killing time when we stumbled across an almost new Kitchen Aid for $150. It was actually that find that set off the appliance buying. Sometimes, you just need to be a little lucky.